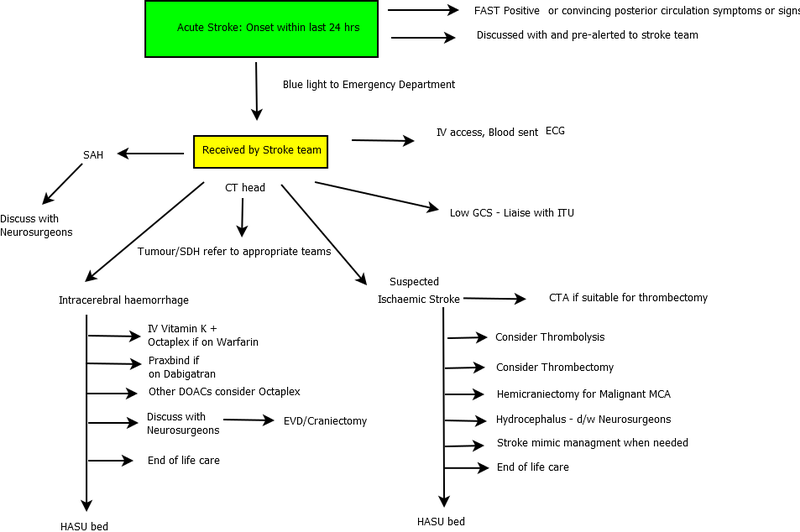 The overriding concept in hyperacute care is that "time is brain" and that systems must be in place to rapidly receive acute stroke patients and quickly assess them. There are two real streams, those who may be suitable for urgent and active therapies and others who need general physiolgical support and the prevention of complications. Urgent therapies would include Stroke Thrombolysis and Mechanical Thrombectomy and reversal of anticoagulation to halt haemorrhage in those with ICH such as those on anticoagulants and those deteriorating due to massive ischaemic or haemorrhagic stroke due to oedema or hydrocephalus or haematoma who may benefit from decompression, External ventricular drainage (EVD) or craniectomy. These patients will become immediately apparent. The key is to have stroke trained staff receiving these patients with no needless delays holding up the process. Once seen, immediate CT scanning should be done and this will aid management. Locally we aim to deliver thrombolysis within 20 minutes from arrival so we meet and greet the patient, get a handover from paramedics, establish time of onset and any possible contraindications to lysis such as anticoagulation. In the meantime, the patient is quickly booked on systems and CT head booked and it's straight off to CT taking a history and examining on the way and while waiting. The history is focused as is the examination. Family are kept close by to help information gathering and they may be involved in the consenting process. The doctor and stroke nurse push the patient to CT and help radiology staff and at no point should the patient be waiting with no productive activity in place. One the CT is done it can be inspected, the BP re-checked, the weight verified, and a quick checklist of contraindications and consent checked then we can prescribe and administer Alteplase. There is no need to do an ECG or to await blood results on the majority of patients. Each hospital has its own distinct preferences, some thrombolyse in the emergency department, others on the Hyperacute stroke unit. The main issue is to continually review your pathway to make sure it is efficient and safe and remove needless delays. Small improvements can all add up to significant reductions in door to needle times. The initial stroke cased is based around several basic principles of identifying early acute interventions which may help and protecting the patient from complications. Premorbid state Thrombolysis/thrombectomy reduce dependency. If already dependent then benefits less. CT report We will look at it but do not refer for reperfusion (thrombolysis/thrombectomy) if haemorrhage or tumour or advanced stroke changes suggesting stroke is older than thought. If unsure discuss. Comorbidities If the patient has advanced malignancy or other diseases possibly contraindicating alteplase. Any recent bleeding issues or trauma must be noted and any non investigated severe anaemia. Blood pressure Need BP < 185/110 mmHg to give alteplase.